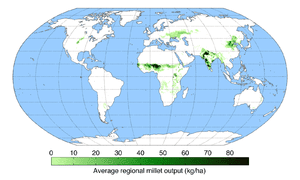 New University of Minnesota research shows current growth in global crop yields will be insufficient to feed the world in 2050 and identifies focus areas for closing the gap. Crop yields worldwide are not increasing quickly enough to support estimated global needs in 2050, according to a study published June 19 in the open access journal PLOS ONE by research associate Deepak Ray and colleagues from the Institute on the Environment (IonE) at the University of Minnesota. Previous studies estimate that global agricultural production may need to increase 60–110 percent to meet increasing demands and provide food security. In the current study, researchers assessed agricultural statistics from across the world and found that yields of four key crops — maize, rice, wheat and soybean— are increasing 0.9–1.6 percent every year. At these rates, production of these crops would likely increase 38–67 percent by 2050, rather than the estimated requirement of 60–110 percent. The top three countries that produce rice and wheat were found to have very low rates of increase in crop yields. The analysis maps global regions where yield improvements are on track to double production by 2050 and areas where investments must be targeted to increase yields. The authors explain that boosting crop yields is considered a preferred solution to meet demands, rather than clearing more land for agriculture. They note that additional strategies, such as reducing food waste and changing to plant-based diets, can also help reduce the large estimates for increased global demand for food.